Andrew Jackson was born in the backwoods of the Carolinas in 1767 where he received sparse education. At age thirteen he fought in the Revolutionary war and was held in a prisoner of war camp. By the end of the war, Jackson was the last living member of his family. He studied law for two years, served as a Tennessee Senator and Representative, became a national hero as a general in the War of 1812, and engaged in numerous brawls and duels to defend his honor and the honor of those around him. As politics began to centralize around Jackson, the Democratic Party formed around him and another party, the Whigs, grew directly as opposition to him. During his presidency, Jackson destroyed the Second Bank of the United States, a “private corporation but virtually a Government-sponsored monopoly,” because he believed it as having unequal economic privilege. Jackson achieved reelection in 1832 with more than 56 percent of the popular vote, almost five times as many votes as his primary opponent. During his second term as president, Jackson took on John Calhoun and South Carolina’s effort to nullify a national protective tariff. Tensions rose, but Jackson did not back down, claiming that states are not free to do whatever they want. South Carolina backed down, successfully holding off secession and the Civil War for the rest of Jackson’s lifetime. Andrew Jackson achieved national fame for his involvement as a general in the War of 1812, especially the Battle of New Orleans. This fame skyrocketed him into the public eye, leading to a successful political career. However, his involvement in the War of 1812 as well as the First Seminole War contributed to a preexisting discrimination against Native Americans, a view held by a majority of white Americans at the time. When he became president, Jackson set out to implement his pro-white settlement policies, forcing the Native Americans off their land. In 1830 Jackson signed the Indian Removal Act, ordering the relocation of the American Indian tribes to west of the Mississippi. This also known as the Trail of Tears. During the election of 1824, there was still this idea of reciprocity among elite men that was still fairly common. Jackson lost to John Quincy Adams because of this “I’ll scratch your back, you scratch mine” type of mentality, in what became known as the corrupt bargain. This infuriated Jackson, who had won the popular vote by a large margin, and so by the time the election of 1828 came around he took no chances. During the campaigning of this election, we see the first real use of mudslinging in American politics. Mudslinging is basically attacking your opponent rather than his policies. John Quincy Adams did not believe in this kind of campaigning, but his followers did. They put out Coffin Handbills, which declared the number of men Andrew Jackson had killed, as well as claimed Jackson’s mother was a prostitute and his wife a bigamist. Jackson came back with plenty of ammunition about the corrupt bargain. 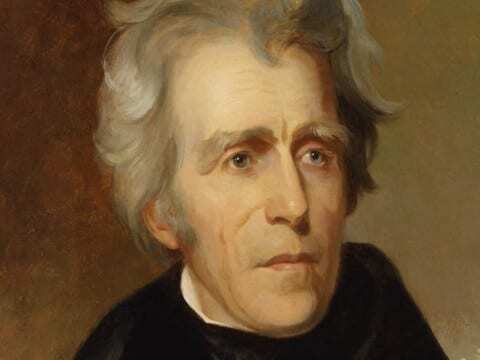 In addition, Andrew Jackson was the first candidate for the Democratic Party, which had really formed around his “common people” cause, in the election of 1828. With his Democratic Party, Jackson tapped into this idea of mass party democracy. Political machines started working for him and people started following him and the party fervently. This was the first time anyone had ever really identified with a political party as part of who they are. Andrew Jackson in the Modern World (4) by Olivia is licensed under a Creative Commons Attribution-ShareAlike 4.0 International License.